(NaturalNews) Hitler had a depopulation agenda which he kept under wraps, until so many millions of people disappeared that the world started figuring out what was happening. What if he had come right out and announced his plan to create a master race and eliminate everyone else by shooting them in the head with two bullets, starving them to death, or putting them in gas chambers? How many people around the world would have supported him and said they liked the idea of getting rid of all the "undesirables" and blaming them for all the world's problems? Well, Bill Gates and George Soros are also all about depopulation, but there's no way they're going to come right out and say it ... or has Bill already done so? What if you found out right now, by video, that Bill Gates, along with his partner in crime, are planning on reducing the world's population by about 5 billion over the next decade, and that they plan on using vaccines and genetically modified food to do so? Here it is. United States citizens underestimate the devastating power of consuming pesticides daily. Sure, most Americans say they want labels on GMOs, but they're not getting them anytime soon, so now what? Also, most Americans believe vaccines are a good idea for combating infectious disease, and two out of every three people get a flu shot yearly, but do they know what the typical ingredients are and what chronic damage they're really doing to their brains and nervous, immune and reproductive systems? Bill Gates and George Soros know. These two super rich white dudes are not trying to save poor people in Africa, or India or Brazil. They don't care at all about the health of underprivileged societies, but what they do care about is making sure these folks can't reproduce, and that if they do reproduce, they are creating deformed, severely autistic, cancer-ridden beings that won't reproduce or even lead productive lives, but rather cost their parents all of their earnings and savings just to care for them. Bill Gates has spoken at a TED conference saying he can reduce the world population by billions using vaccines. How so? If vaccines supposedly prevent infectious disease, how does that equate to killing off people or keeping them from multiplying? Great question. As of 2016, it's approximated that 7 million people in South Africa have HIV, with over 300,000 new cases arising every year. Of those, nearly 200,000 die each year from an AIDS related death, usually because their immune systems are next to non-existent, so anything from a head cold to the flu could drive them into their graves. What else could "kill off" these "undesirables?" Vaccines that contain known neurotoxins and heavy metal toxins. It's called eugenics, and some tall white guys are running the show. "Trials" are underway, and Bill Gates, the ultimate population control promoter and self-declared philanthropist, is pumping money into the pharma labs to concoct an AIDS vaccine. The CDC defines DNA vaccines as "purified plasmid preparations containing one or more DNA sequences capable of inducing and/or promoting an immune response against a pathogen," yet there is no proof that this really works as stated, and research shows that when these sequences are injected they can cause "insertional mutagenesis," which means gene and cell mutations can result – and that's also the definition of carcinogenesis, or "cancer." Care to turn off your tumor suppressor genes? Bill Gates and George Soros would love it if you did. That could help reduce the world population "problem" they are so righteously battling for us. Could these novel sounding DNA vaccines actually create human tolerance to pathogens instead of immunity? Why would billionaires who support and promote cancer-causing, pesticide-laden GM food support a vaccine that creates immunity? It wouldn't make sense. That would be like breeding and releasing millions of poisonous snakes while creating and promoting anti-venom inoculation. Watch out for hoax vaccines that contain neurotoxins. Ask your naturopathic physician if the highly experimental, untested and dangerous Zika, HIV, Ebola, Anthrax, HPV, Swine Flu, MMR and DNA vaccines are "right for you" and your children. 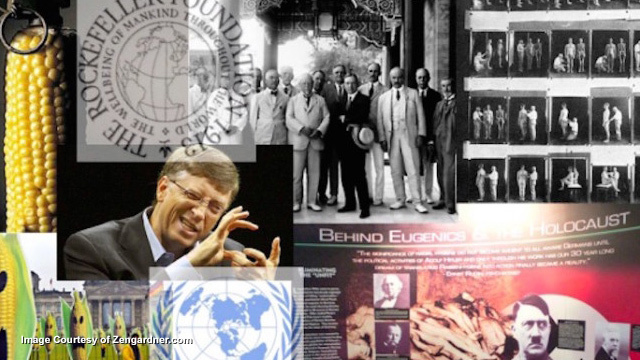 What does America's dark history of eugenics mean for society today?